After touring New York’s Southern Tier, the final part of our vacation was in western Pennsylvania, principally Pittsburgh where we spent two nights and a full day. Our first night back in Pennsylvania was actually spent in Warren in the northwest part of the state. I hadn’t heard of Warren before, but Warren turns out to be quite charming with its history going back to its founding in 1795. Perhaps it is largely unknown because it is so hard to get to. No major interstate comes near it. Warren is not that different than Corning, New York but perhaps not quite as well moneyed and snooty as Corning. The city has less than ten thousand people but publishes a daily newspaper (except on Sundays), the Warren Times Observer. The city is clean and like Corning full of well-maintained Victorian homes. The charming Alleghany River flows through it. You know a city is doing well when it is hard to find a parking space downtown. My brother Mike was in the area so we connected at the Plaza Restaurant on Pennsylvania Avenue, which serves tasty and amazingly cheap Greek food (cash only). Our night was spent peacefully at an almost new Hampton Inn north of the city. Trying to get from Warren to Pittsburgh forces you to cross and re-cross the serene Alleghany River along U.S. routes 6 and 62 and pass through a couple of cities a lot like Warren, like Oil City and Franklin. The drive is as serene as the river, which was beautiful and except for a few kayakers spotted near Franklin largely undisturbed by humans. I was glad for the change of pace. Interstates are undoubtedly fast and convenient, but it’s also nice to spend hours on unfamiliar but bucolic two lane roads, pass through a national forest and see farmers’ markets along the side of the road. After a couple of hours of this kind of driving we reached serious highway: I-80, then we scooted south on I-79 into Pittsburgh. As with our trip to Philadelphia, one full day merely gave us a chance to sample Pittsburgh. Overall, I enjoyed Pittsburgh, but not enough to want to live there. Still, it has all the amenities of a big city including two outdoor sports stadiums with long established franchises, theater, arts centers, museums (most of them funded by endowments from the late industrial magnate Andrew Carnegie), great restaurants, not so great restaurants, dive bars and most importantly The Strip District, more often referred to as simply “The Strip”. 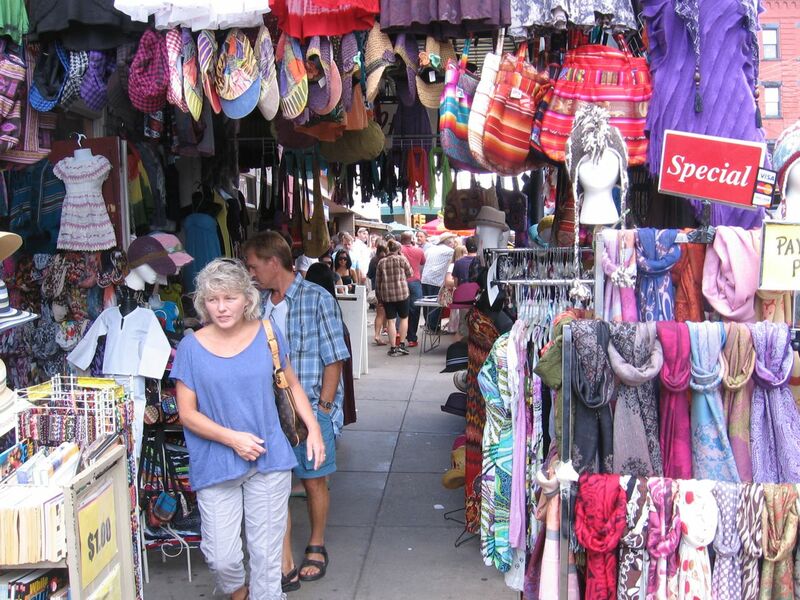 No strip clubs here, but several long city blocks of eclectic shops, about one third eateries and two thirds various curiosity shops, and sidewalks cluttered with every conceivable kind of street vendor, mostly selling wares for the shops they faced. It’s also strange in that it largely closes down by 5 p.m. Most cities have a “strip” but “The Strip” is the real deal, a great tourist destination in itself, except for night owls. We spent several hours on the strip and could have spent more. At one end of The Strip, I found St. Stanislaus Kostka Church, one of these old Catholic city churches that are getting hard to find, with long rows of votive candles, an ornate altar that betrays its pre-Vatican II construction and lovely stained glass windows. It feels more like a mini-cathedral than a church, and the church wisely leaves it open for tourists. 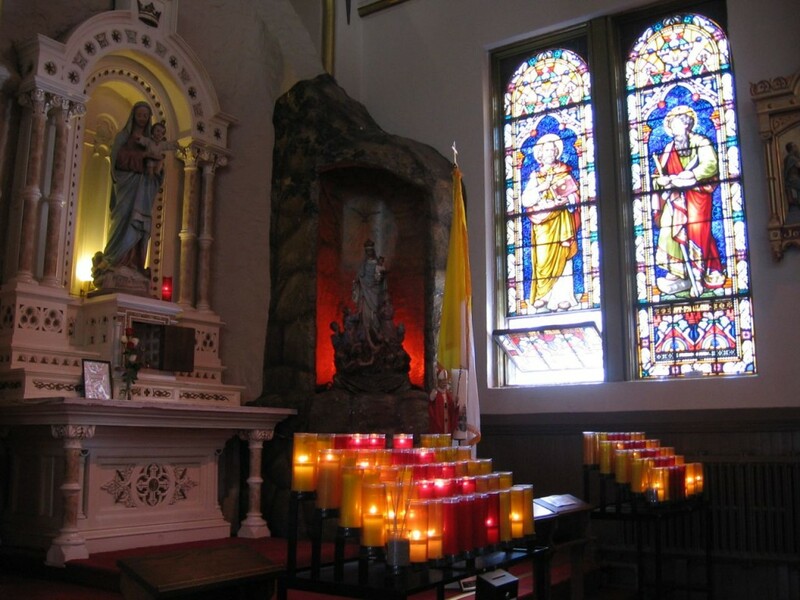 Since I so rarely go into Catholic churches anymore, I made a point to drop three bucks in the box and light a votive candle for my late mother, whose spirit wherever it may be I am sure appreciated my gesture. The best view of Pittsburgh turned out to be not at the top of the Duquesne Incline but by boat. We chose the Gateway Clipper Fleet and its three-story boat for the one-hour tour, which was just long enough to feel like you had experienced Pittsburgh without having really experienced it. Lovely temperate weather, a gentle dry breeze and blue skies full of puffy white clouds made the short cruise surprisingly memorable. Spending so much time on The Strip left little time for the one museum that we visited, the Heinz History Center near one end of The Strip. 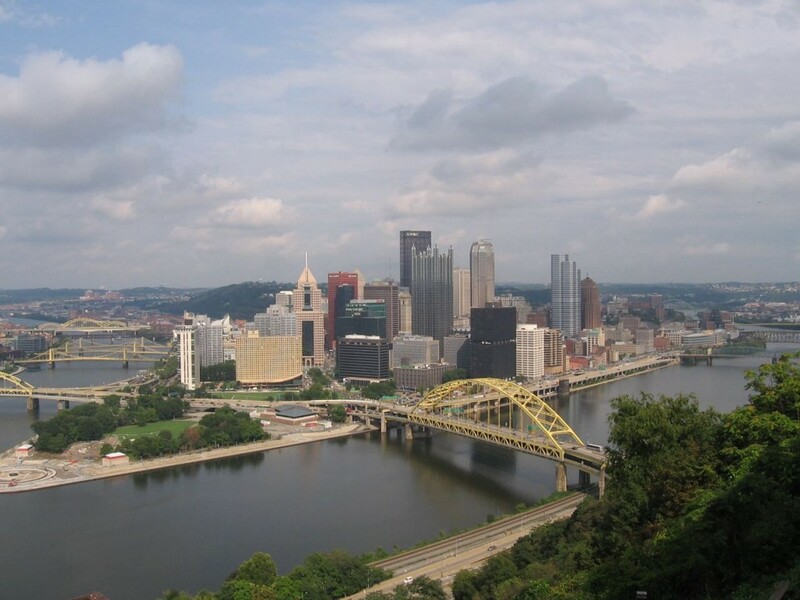 Pittsburgh does have a fairly extensive history. What we found most interesting was the fifth floor, with its detailed exhibits and artifacts from the French and Indian War, which few people remember. More would remember it if they knew it was started by a 22-year-old upstart British colonel from the colonies named George Washington. It would turn into arguably the first world war, and take seven years to fully extinguish. Washington’s defeat at Fort Necessity turned into an eventual big win for the British, and subsequently for the United States, after it declared independence and spread across the formerly French-claimed Ohio Valley. We also found the story of Lewis & Clark’s expedition interesting as well, which started in Pittsburgh. Each level at the museum has a theme. Sports fanatics will find levels celebrating the accomplishments of Pittsburgh’s Pirates and Steelers. Architecturally, Pittsburgh definitely feels major league, with a skyline that rivals or exceeds Philadelphia’s and with many of the buildings downtown looking very new and modern. It has the T, it’s version of a subway system and an extensive bus system as well. At least downtown it is largely clean and modern, except for warehouses and railroad areas near The Strip District. Its smelters are largely gone but lots of steel remains, and what has replaced steel is a lot of clean industries, mostly IT and service related. Black clouds of coal soot no longer obscure the view of Pittsburgh. Today except for occasional haze and high humidity the view is crystal clear. Sunday we reluctantly headed home, but made one last detour for a tour of FallingWater, Frank Lloyd Wright’s masterwork house designed for Edgar Kaufmann Sr., a successful local businessman best known for a department store with his name. The house sits fifty miles of so southeast of Pittsburgh and was sort of on our way home. Most people know the house as the house built over a stream, specifically Bear Run, which even in 1936 when construction began was known for its exceptionally clear and unpolluted waters. The stream is so pure that Wright even constructed a natural swimming pool attached to the guest quarters fed directly from runoff from the stream. It’s great swimming if you don’t mind it very much on the chilly side and a little algae in your water. Stream temperatures rarely get beyond the sixties and are frequently much colder. The house is definitely amazing, in a 1930s way, for how nature and architecture can be melded together to provide living space. Air conditioning was not available for houses back then, but it is rarely needed. However beautiful the house is, it is impractical and ultimately flawed. The foundation maintaining the house says it costs six million dollars a year simply to maintain the house. Ten years ago it underwent expensive restoration simply to keep the house on its moorings. How many of us could afford six million dollars a year in maintenance costs? The inside of the house also lacks modern conveniences: handrails for staircases, staircases that are artificially narrow, and ceilings that are too low (at least for tall people like me). All these deficiencies aside, it is an amazing work of architecture, just not the least bit practical. Our modern houses may be made mostly of wood and drywall, but they are much less costly, much cheaper to maintain and arguably much more comfortable to live in than FallingWater. 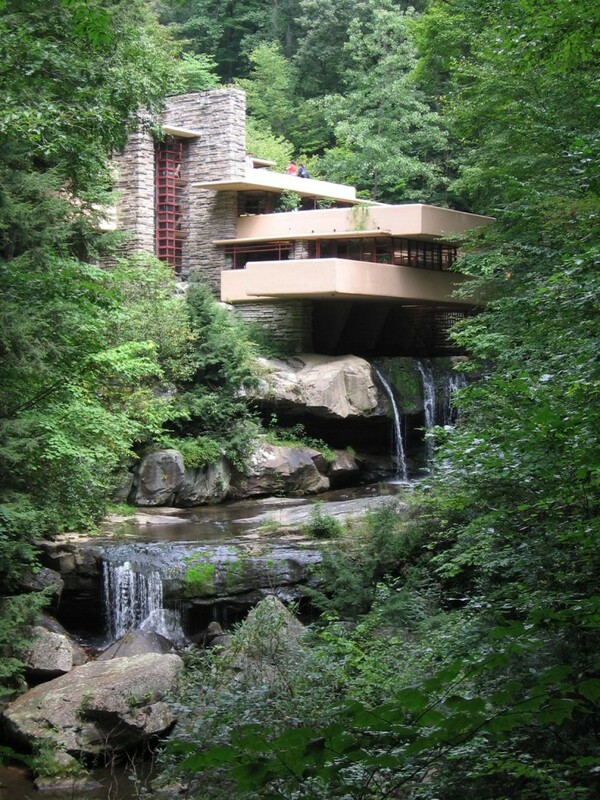 Without extensive repairs, FallingWater would now mostly be falling into the water, and that would not speak well of Wright’s masterwork.